a. They put out their stock in the electronics department at about 5:30.
b. There is a box from Nintendo marked to be put out on the 24th of March. 6:43 - Arrive at local Walmart, see no Gold Mario Amiibo on shelves or displayed. There isn't a space made on shelves for either game or Amiibo so I assume they haven't been put out. 6:43 - Me and a fellow Gold Hunter inquire a Walmart employee about Gold Mario Amiibo. 6:45 - No Gold Mario Amiibo or Mario Party 10 With Gold Mario Amiibo can be found. 6:46 - Told to wait for department manager (Arriving at 7:00) as she might know the whereabouts of the Gold Mario Amiibo. 6:50 - Head to McDonalds for some CinnaMelts. Purchase two (2) CinnaMelts. No Drink. Proceed to sit in the parking lot. 7:04 - After consuming delicious CinnaMelts, I reenter Walmart and wait for the arrival of the Electronics Department manager. The fellow Gold Hunter is still waiting. 7:12 - Inquire Electronics Department manager about Gold Mario Amiibo. She seems disinterested in my First-World need for the Gold Mario Amiibo. She leaves to the warehouse to check for Gold Mario Amiibo. 7:24 - Electronics Department manager returns to say she could not find any Gold Mario Amiibo. 7:25 - Me and fellow Gold Hunter begin to describe how we expected them as the Walmart website displays "In Stock" as well as citing the release date as March 20th. 7:25 - Electronics Department manager is as unhelpful as ever. I depart for a short day at work. 9:55 - I leave my work after a very short day. In hopes of some good fortune, I return to my local Walmart. Still no Gold Mario Amiibo. 10:11 - I call a nearby Walmart to inquire about Gold Mario Amiibo availability. None are available at this location. 10:13 - I call another nearby Walmart to inquire about Gold Mario availability. Employee puts me on hold to check. Asks me to call back in ten (10) minutes. 10:29 - I call back, but am greeted by a different employee. She informs me that they only received four (4) of the Gold Mario Amiibo and all were sold when they were put on shelves. 10:33 - I call yet another nearby Walmart to inquire about Gold Mario availability. Employee informs me that they haven't received any Gold Mario Amiibo since I called this morning(?). I did not call this morning. 10:33 - I return home, without my desired Gold Mario Amiibo. I will reattempt on this mysterious "March 24th" date. 12:49 - Purchase a Gold Mario Amiibo on eBay for an amount I am embarrassed to admit to. 7:15 - After some casual research I discover a local Walmart has Gold Mario Amiibo available for purchase. I attempt to purchase online for in-store pickup. I learn that if there is a availability threshold that limits in-store pickup purchases if under a certain amount. 5:40 - I wake up early to adventure to the local Walmart and purchase my own Gold Mario Amiibo, first making a call to ensure it's availability. 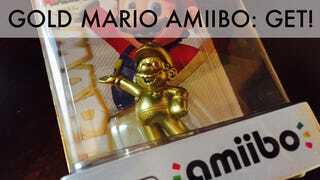 7:04 - I have purchased my own Gold Mario Amiibo. Mission accomplished.